Pinout diagram of a QTRX-HD-xA Reflectance Sensor Array. 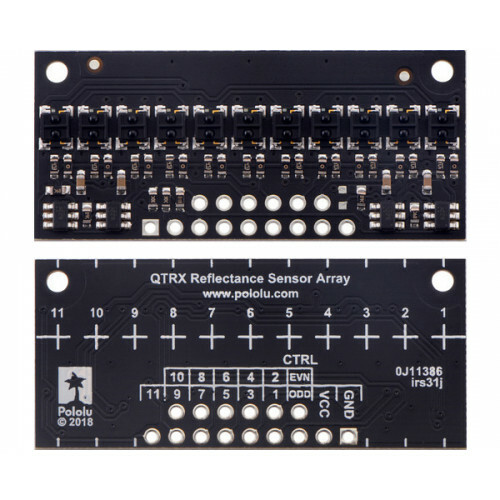 QTRX-HD-11A Reflectance Sensor Array, front and back views. 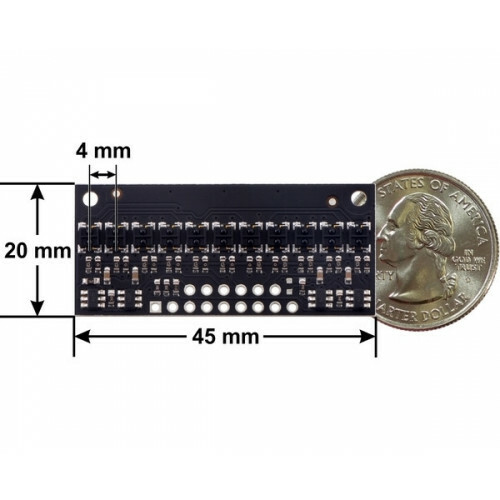 QTRX-HD-11A Reflectance Sensor Array dimensions. 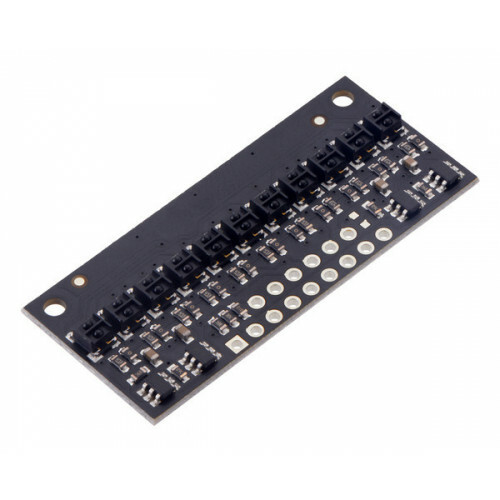 Unlike our original QTR sensor modules, these units have integrated LED drivers that provide brightness control independent of the supply voltage, which can be anywhere from 2.9 V to 5.5 V, while enabling optional dimming to any of 32 possible brightness settings. 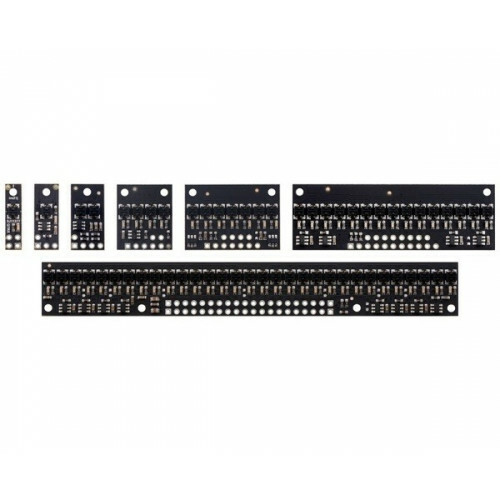 For high-density (HD) modules with five or more sensors, there are separate controls for the odd-numbered and even-numbered LEDs, which gives you extra options for detecting light reflected at various angles. 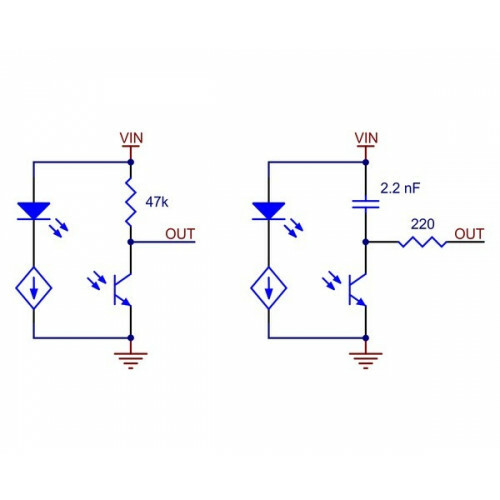 See the “Emitter control” section below for more information on using this feature. 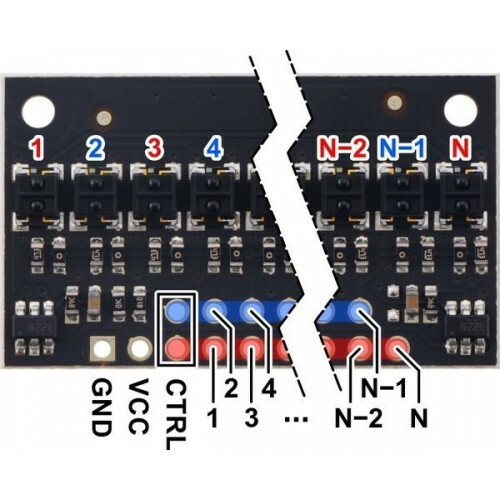 Units with five or more sensors in a high-density (HD) arrangement have two emitter control pins: CTRL ODD and CTRL EVEN. By default, these are connected together with a 1 kΩ resistor and pulled up, turning on all the emitters by default and allowing them to be controlled with a signal on either pin, but the CTRL ODD and CTRL EVEN pins can be driven separately for independent control of the odd-numbered and even-numbered emitters. Units with three or more sensors in a medium-density (MD) arrangement also have two emitter control pins since these are made by only populating every other sensor on an HD board, but only the CTRL ODD pin will have an effect on these versions (it is not possible to independently control alternate emitters). Units with four or fewer sensors have a single CTRL pin that controls all of the emitters.